Installing a stone patio can add value to your home as well as beauty to your outdoor landscaping. Stone is much lower maintenance than wooden decking and can add more visual interest than concrete, all while providing you a place to barbecue or simply relax away from the heat of the day. While low maintenance, there is some work to do to ensure your patio stays beautiful and functional for years to come. Because your stone patio is susceptible to everyday dirt and natural grime, it is important to clean it periodically. Keeping your patio free of loose dirt and plant debris can help prevent scuffing and buildup. Remove all patio furniture and potted plants before sweeping the entire patio in one direction, then the opposite. This method ensures you remove any material trapped between the stones. Use clean water from a hose to spray surface dirt and dried-on debris from your patio. If necessary, use a stiff brush to loosen any resistant patches, and repeat spraying to wash away residue. Greasy stains near patio tables, grills, and barbecue areas can be treated with a solution of dish soap and water. Use a stiff brush to work the solution into the stain and rinse away with a hose. If there is remaining residue, clear the area of the soap solution and treat with an ammonia solution – ½ cup to one gallon of warm water. Ensure to rinse all the ammonia solution away before proceeding. Treat any biological stains, such as mold and mildew, with a solution of ½ cup of bleach to one gallon of warm water. Scrub the affected areas with a stiff brush and remove any excess solution with rags or towels before rinsing with a hose. Allow stone to dry adequately before replacing furniture and plants. 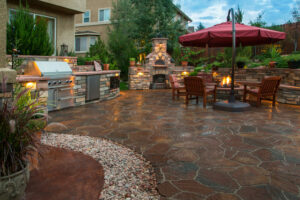 Most stone patios should be sealed to prevent water stains and excess absorption of grease or biological stains. After you’ve thoroughly cleaned your patio, wait at least one day to allow your stone to fully dry before proceeding to seal. Use an acrylic, water-based matte sealer designed for porous outdoor stone. Choose a hot, dry day to ensure rapid drying of your stone. Ensure your area is free of loose dirt, clean, and dry by following the steps outlined above. Using a clean paint roller, roll the sealant on in large, generous strokes. Roll over each stone only once to avoid streaking. Allow the sealer to dry for one hour – it should be dry to the touch before reapplying. Allow the sealer to dry for 48 hours before walking on the surface or replacing patio furniture. For more information regarding care and maintenance of your stone patio, contact DiSabatino Landscaping today. Posted in hardscaping, hardscaping design, outdoor living space, patio cleaning tips, patio designs and tagged How to Clean and Seal Your Stone Patio, Sealing Your Stone Patio on April 16, 2019 by Denise Bernstein. Spring is the time our customers start thinking about installing a new deck or patio. A patio or outdoor living area is becoming a popular element for extending a home’s square footage and makes for spectacular entertaining. Before starting a hardscaping project, it is wise to research the various options and materials available. It is best to look for materials that are safe and blend or contrast nicely with your home and surrounding landscape. Natural stone (typically referred to as flagstone or slate) is a very attractive material that holds up well to the elements. The color does not fade as much as many manufactured products and has a unique appeal. Someone who values a classic or rustic aesthetic might choose this product. It can be installed both with cement and polymeric sand joints. Versatility and looks make this material a great selection for any property. Keep in mind that natural stone typically costs more because it has to be trucked in from a quarry. It can also take more time to install, hence upping your labor cost. Concrete Pavers are the most popular recent addition to our material pallet. They are more cost effective than natural stone, yet still offer a similar aesthetic. There are a vast number of shapes, sizes, and colors available. 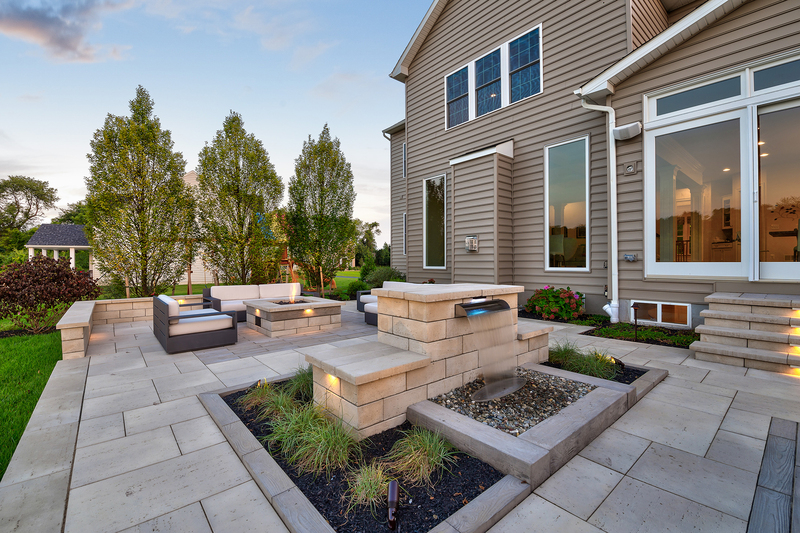 It is important to do your research when determining which paver you will install in your yard. Not all manufacturers are alike. While the material itself if more cost effective, the install is also easier due to their uniformity & therefore are more wallet friendly. This does not come without drawbacks however. You will need to be more mindful in terms of maintenance if you want your patio to keep its original luster if you choose this material. Polymeric sand joints need repaired every 3-5 years so that weeds do not grow in, and sealers can help to reduce the fading that occurs over time. Decorative Concrete is an old concept that has benefited from new install techniques in the past couple of decades. Options range from brushed finish (typical sidewalks) and exposed aggregate (tiny pebbles) to stamped concrete with synthetic designs printed onto them. If you are not in love with man-made looking products this may not be for you. However, it is a highly durable and cost effective option that does not need a ton of maintenance. 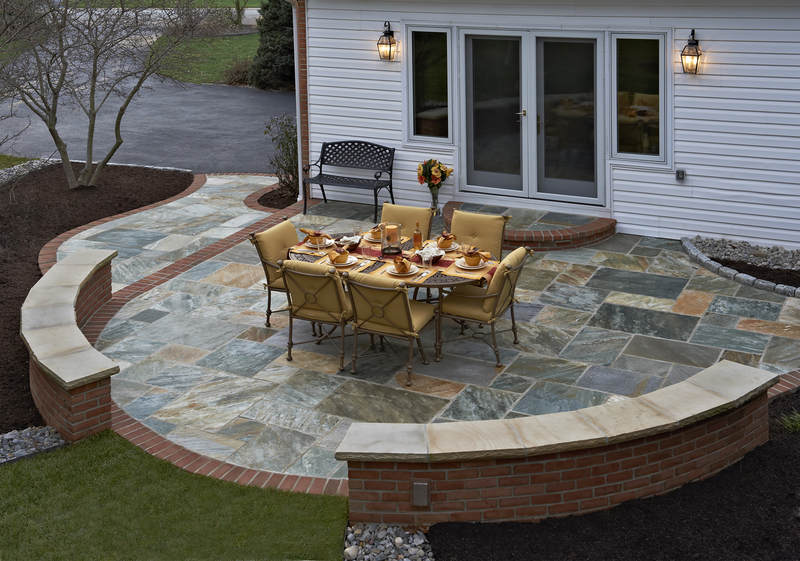 At the end of the day, your patio must fit your family’s needs. It is important you know what you are committing to with whichever material or method you decide to go with and that you have a reputable installer to assist you with the process. Posted in decorative concrete maintenance, hardscaping, hardscaping design, outdoor living space, patio designs, pergola and tagged beautiful patios, outdoor architect, outdoor living space, Prepare Your Patio for Spring, slate patio on May 15, 2018 by Denise Bernstein. 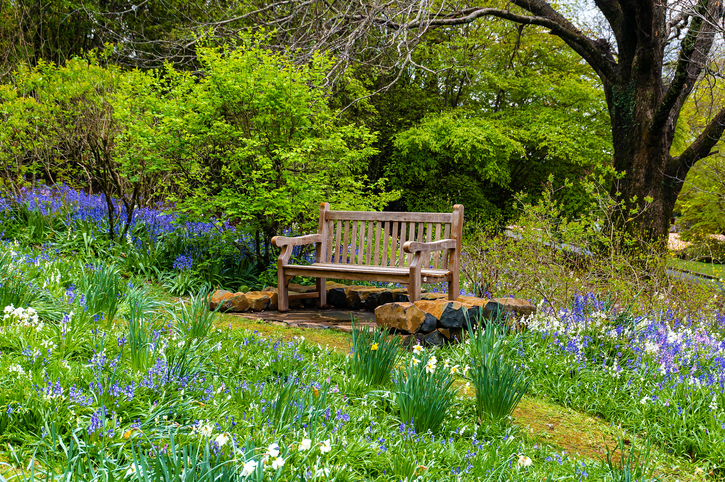 Celebrate Spring With An Outdoor Living Space To Die For! I am sure many are skeptical that spring will arrive to Delaware any time soon. With a fourth nor’easter ushering in the season of rebirth, it is hard to imagine warm days and nights spent enjoying the outdoors. Yet, as sure as the sun rises and sets each day, the warm weather will be here soon. 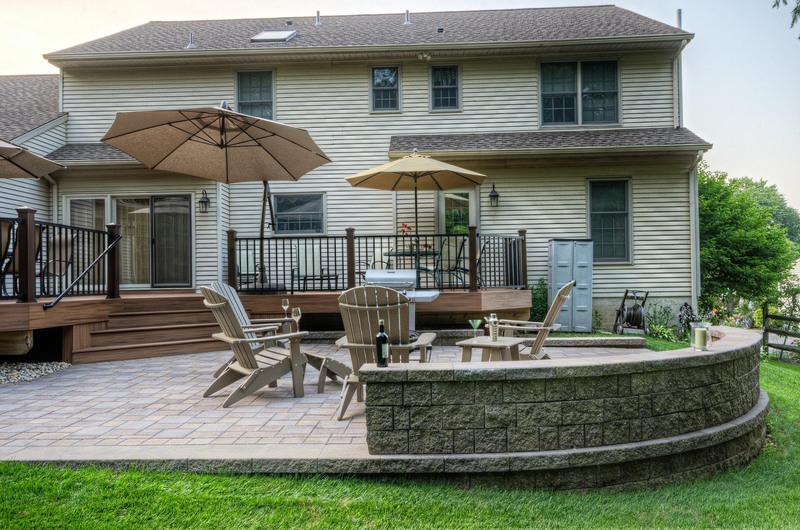 Make this the year that you enhance your backyard with a Pergola, sunroom or a beautiful outdoor living space installed by Delaware’s #1 hardscape experts, DiSabatino Landscaping. 1) A Pergola can provide a beautiful accent to your rear yard. The structure alone can produce a comfortable amount of shade. Enhance that shade with a retractable canopy or overhead lattice work. 2) An Open Rear Porch is a wonderful way to enjoy the outdoors in any weather. The roof will provide protection from the sun and the rain. Add retractable screens for protection from insects. Add heaters to warm the area for all season entertaining. 3) A Sunroom is another wonderful way to enjoy the outdoors. Add wide open screen windows or a grand wall of doors that slide open to let fresh air in. Sunrooms can also have heat and air conditioning for yearlong enjoyment. Don’t forget the accents like an outdoor kitchen, fireplace, television or sound system to create your total outdoor living experience. Entertainment can be a breeze with an outdoor living space full of all the luxuries that one would expect to have to go indoors to enjoy. Get family and friends together for some fresh air, great conversation and superb entertainment that will sooth and rejuvenate the soul. 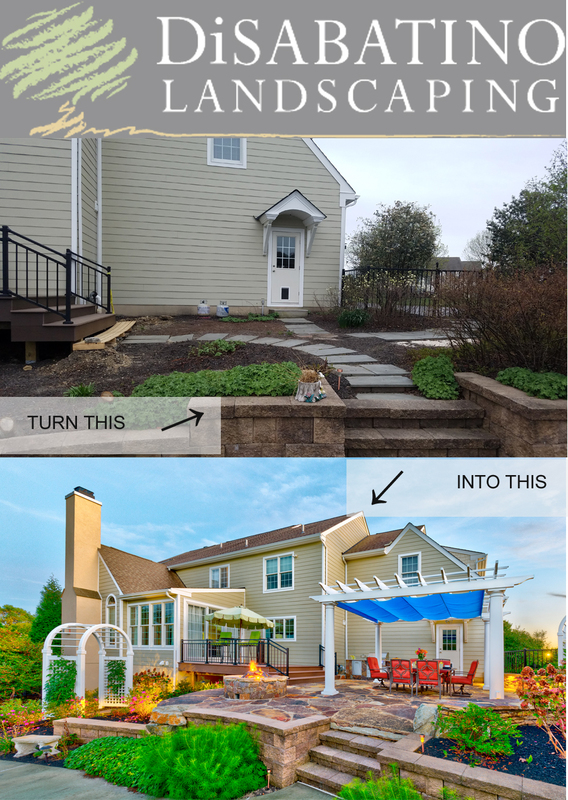 Posted in hardscaping, landscaping tips, outdoor living space, pergola, rear porch, sunroom and tagged beautiful patios, hardscaping ideas, pergolas, sunrooms on March 22, 2018 by Disabatino. This has been one wet winter and as spring approaches, it is not going to dry up anytime soon. When moisture sits continually on cement, brick and stamped concrete surfaces mildew and algae can become a problem. In addition, the freeze and thaw cycles of winter can cause damage to patios that have cracks and crevices. Many are more than ready for the sunny warm weather ahead, but are our patios ready?Now is the time to prepare for the outdoor dinners, cocktail hours and picnics ahead. Getting your patio in shape for the season can make entertaining a breeze. 1 ) Inspect for Ice Damage: As mentioned before, the winter can cause damage to patio surfaces when water seeps into cracks or crevices and freezes. Early spring is the time to assess any damage done from freeze/thaw cycle. Not only do cracks or chipped areas on concrete look bad, they could deteriorate even further if not repaired. The approach to repairing these surfaces will vary depending on a number of variables. Check out this Quickrete® Guide on Repairing Concrete. 2) Clean off Mildew and Algae: How you deal with ridding a patio of mildew and algae with depend on the severity of the stains. It is recommended to start with a stiff broom to sweep off as much dirt and debris as possible. While using a power washer is less caustic, it often does not work on stubborn stains. Using bleach or vinegar is effective, but it could do some real damage to your lawn and landscaping. Baking soda is more natural and gentler solution – try mixing ½ cup baking soda to one gallon of water and 1/8 cup of liquid dish detergent first. Spray it on the patio surface, let it sit for 30 minutes, then scrub and rinse. If your patio does not receive enough sun to dry up on a regular basis to prevent recurring mildew and algae, consider pruning or removing some trees to allow more sunlight to reach your patio. 3) Apply Sealant: If your patio has not been sealed in that last 3-5 years, it would be wise to have a sealant applied to prolong the life of your patio. Sealer provide a tough, water-resistant finish that is protects your patio from exposure to water, common acids, alkalies, petroleum, solvents, oils, greases, and salts. Call a professional hardscape specialist to have sealer applied. Posted in decorative concrete maintenance, hardscaping, outdoor living space, patio designs and tagged Prepare Your Patio for Spring on March 6, 2018 by Disabatino. DiSabatino Landscaping of Delaware has built a stellar reputation for quality custom hardscape designs in the Delaware area. This example above shows how we can convert a aged and stained brick patio can be converted to a beautiful slate patio edged superbly with red brick. Note the excellent use of space and the professional way in which the designers meld this outdoor space to reflect the nature of the home’s design. Creating an outdoor living space increases the square footage of your home and increase its value and curb appeal. Posted in decorative concrete maintenance, hardscaping design, landscaping tips, outdoor living space and tagged Delaware Hardscaping Experts, hardscape specialists, outdoor living space design, slate patio on November 21, 2017 by Disabatino. Don’t Settle For Second Best – Hire the Premier Outdoor Architects Today! Our professional landscape team created this beautiful outdoor living space for a residence located in Garnet Valley PA. We added a modern waterfall feature at the center of the walled stone patio with a conversation fire pit on one side and a full outdoor cooking area with seating for eight on the other. Notice the recessed LED lighting and miniature plantings used as ascents throughout. As well as the mature trees, mulching and luscious sod. As you can see, DiSabatino Landscaping can handle ALL your landscaping and hardscaping needs. Why settle for second best? Hire the premier outdoor architects today! Posted in landscaping tips, outdoor living space and tagged outdoor architect on October 24, 2017 by Disabatino.